Greek food doesn’t get much a look in Melbourne’s west despite the area’s long Greek heritage. So it’s with some excitement that we try Meat the Greek souvlaki bar in Seddon. The space is light and bright, with a few Greek flourishes – like the Mati bottles holding the table numbers – without being over-the-top Zorba the Greek. The menu is simple one-pager of gyros/souvlaki, kids options of smaller servings for only $6, sides and drinks (not licensed). There restaurant’s heroes are the two large spits slowly grilling chicken and pork. Apparently, the Greeks don’t eat lamb in souvlakis so you won’t find a lamb gyro here. We try the chicken gyros ($9), with chicken freshly shaved off one of the two large spits. The meat is marinated in simple herbs and seasoning and has a smoky crunch to the edges. The souvlaki is large and stuffed with tomato, onion, tzatziki and chips ($12). 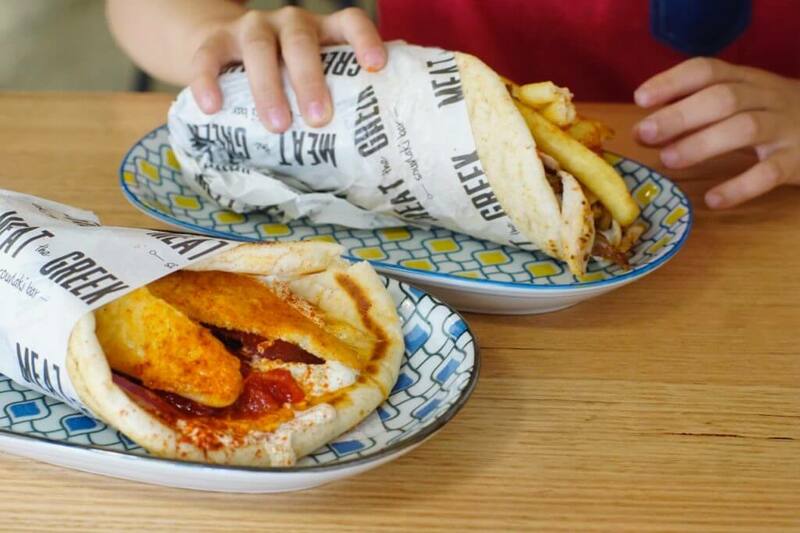 If you’re vegetarian then the saganaki pita wrap ($12) is also a winner, with two fat slabs of paprika-spiked grilled saganaki within a pita bread filled with delicious roasted capsicum, tomato and tzatziki. That’s something coming from someone who doesn’t normally like grilled capsicum! The pita bread used in all the souvlakis is delightfully spongy. 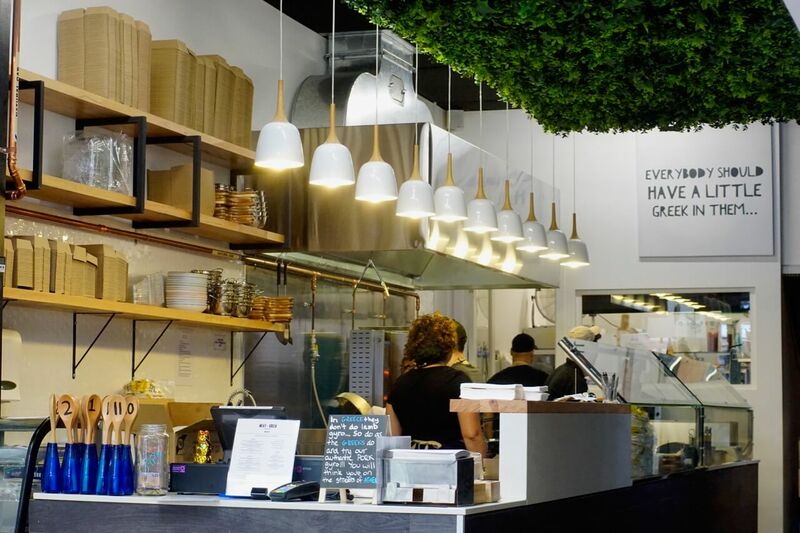 Turns out it comes from the small family business Mr Pitta in Thomastown, who supplies all of George Calombaris’ restaurants and other Greek establishments in Melbourne. You can also buy them from Gourmet Deli House at Highpoint. 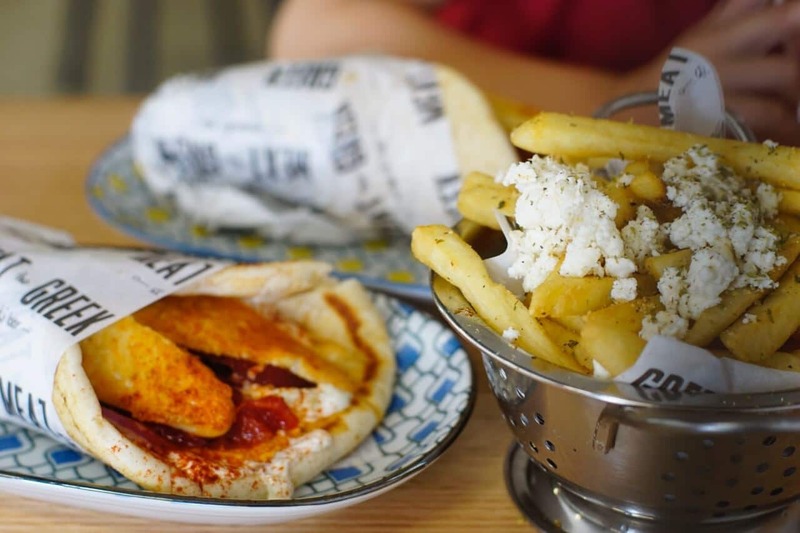 The chips are Greek style and come out piping hot and generously festooned with feta and oregano ($5.50). My only gripe is that I hope they get rid of the plastic cups and start using washable reusable cups. Seeing that sort of unnecessary disposable waste brings out the eco-warrior in me. Meat the Greek is a great way to reintroduce modern Greek cuisine in Melbourne’s inner west. The food is tasty, cheap and filling. We’ll be back!